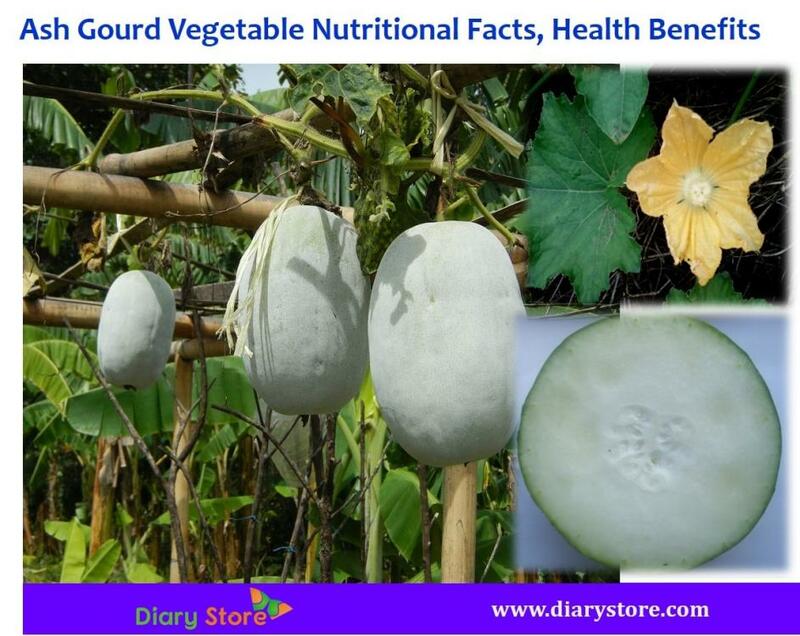 Ash Gourd Vegetable is also known as winter melon, fuzzy melon and white gourd. Ash Gourd belongs to Cucurbitaceae family and the scientific name off ash gourd is Benincasa hispida. Ash gourd is eaten mostly in China and India. Ash gourd is one of the most naturally energizing foods and it is also used for medicinal purposes. Ash Gourd weighs up to 30 pounds and 25-40 cm length. It is pale green in color and has inner white pulp. Ash gourd is mild to taste and contains yellowish brown seeds. You can add ash gourd in salads, smoothies and juices in hot days as it reduces the bodily heat. Ash gourd has amazing nutritional facts. Ash gourd contains 0.04 mg (3% of Recommended Dietary Allowance) of Thiamine, 0.133 mg (3% of RDA) of vitamin B5, 13 mg (16% or RDA) of vitamin C, 0.4 mg (3% of RDA) of Niacin, 0.035 mg (3% of RDA) of vitamin B6, 10 mg (3% of RDA) of magnesium, 0.4 mg (3% of RDA) of iron, 0.058 mg (3% of RDA) of manganese, 19 mg (3% of RDA) of Phosphorous and 0.61 mg (6% of RDA) of zinc. Ash Gourd has good health benefits and it helps us prevent many diseases and fight many ailments. Ash gourd contains more water and is loaded with nutrients. Drinking daily one glass of ash gourd juice helps to lose weight for those suffering from excess weight. Ash gourd contains high amount of fiber which helps to eliminate the excess bile which is formed due to bad cholesterol. Ash gourd prevents all types of cardiovascular diseases. Ash Gourd helps to stop internal bleedings and also to prevent conditions like haematuria, piles, nose bleeds, bleeding through ulcers and other internal organs. Ash gourd helps fight against the formation of ulcers in stomach and intestine. It acts like an anti-microbial agent and it helps clear off harmful bacteria in the intestine and stomach. Ash gourd helps keep gastrointestinal infections and thereby indigestion at bay. Ash gourd is loaded with vitamin C and vitamin B2 which help prevent viruses causing flu, cold and other infections such as pneumonia, pulmonary morbidity and migraine. Deficiency of Vitamin B2 causes migraine. Hence, oral intake of ash gourd daily in requisite doses is advised for people suffering from migraine. Here, you have detailed article on Seasonal diseases and precautionary tips. Read the article on Monsoon seasonal Diseases precautions. Ash gourd contains iron which helps to transport oxygen to brain which and streamline brain function. The deficiency of iron causes mental problems and harms the memory. Consume ash gourd daily; it helps to prevent insomnia or lack of sleep. Insomnia is caused by many reasons like tension, work load and stress. 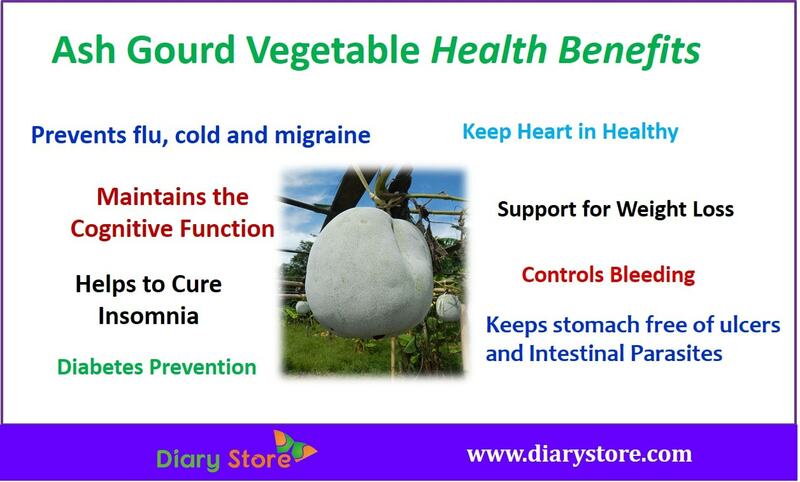 Ash gourd vegetable is a low calorie fruit and has healing properties and medicinal values. Ash gourd boosts the secretion and discarding of urine. Ash gourd has curative effects on diabetic patients. Read diabetes detailed post on Diabetes, prevention and treatment and Experts Tips. Pregnant women should avoid consumption of ash guard during initial months of pregnancy. Mint leaves, dry ginger, cloves and jeera could be used as antidote for the side effects of ash gourd.